Glide is a free messaging app that has been well received on the iOS and Android platforms has finally arrived on Windows Phone. 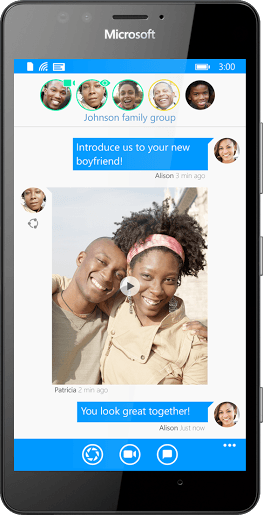 Windows 10 and Windows Phone 8.1 smartphone users can now use Glide to communicate via live video messaging for free. Let’s check out the cool features of the app. Using Glide is easy. Just tap the blue button and your video message will be sent instantly. Tap again when you’re done. Your friends can watch you live as you record, and you can see their response in less than one second after you finished. Glide’s unique feature is that unlike other video calling platforms, Glide messages can be viewed live or later at a more convenient time. 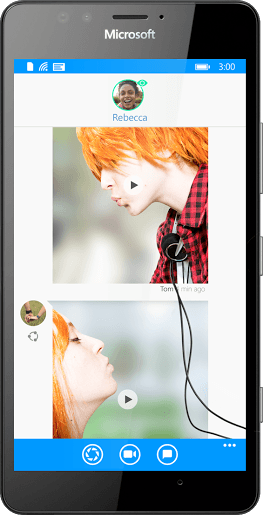 The video messages can go back and forth quite naturally like a text conversation and can include text and photos as well. All conversations in Glide are stored for free on Glide’s secure private cloud, so they can be accessed anytime, anywhere and can be viewed an unlimited number of times. Plus they won’t take up any space on the user’s device. Group chats of up to 50 people – family chats, BFFs, study groups, etc. Keep in touch with people who live far away – the conversation can happen whenever is best for each person, so time zones aren’t an issue. Talk to grandparents – Glide is very simple and doesn’t require typing, so young kids can use it easily. Sign language – Glide is proud to be widely used by deaf and hard of hearing communities around the world who prefer the convenience of video chat.